It's a beautiful day here in sunny Florida. 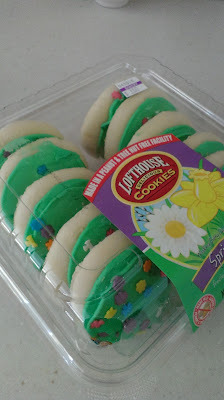 It's St. Patrick's day and it happens to be my turn to bring the afternoon snack to the Sew What group this afternoon. They are more of a Knit What group, but that doesn't matter. They are a fun bunch of ladies and I get all the community news when I go there. Since it's a nice day, hubby and I spent most of our late morning at the pool. Anyway, there's no time to bake. These store bought St. Patrick day cookies are perfectly acceptable to this laid back group of gals. Enjoy your St. Patrick's Day! !